With the advent of viral marketing, many advertisers are trying to place videos wherever they can. Most companies can use this ad revenue to profit. 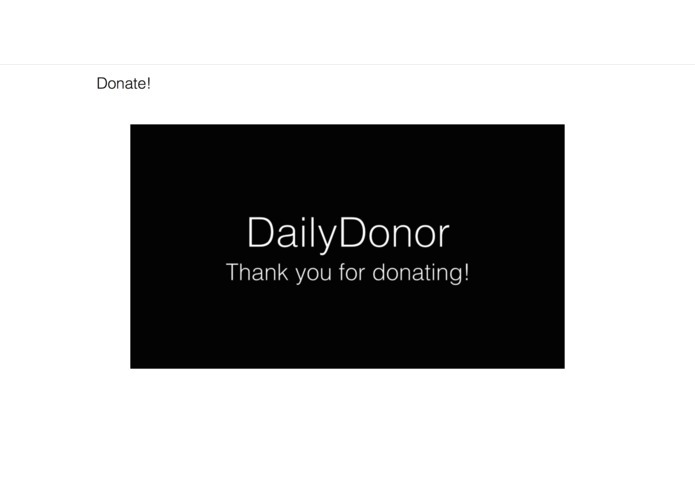 Instead of trying to make a profit from video ads, we donate the money. 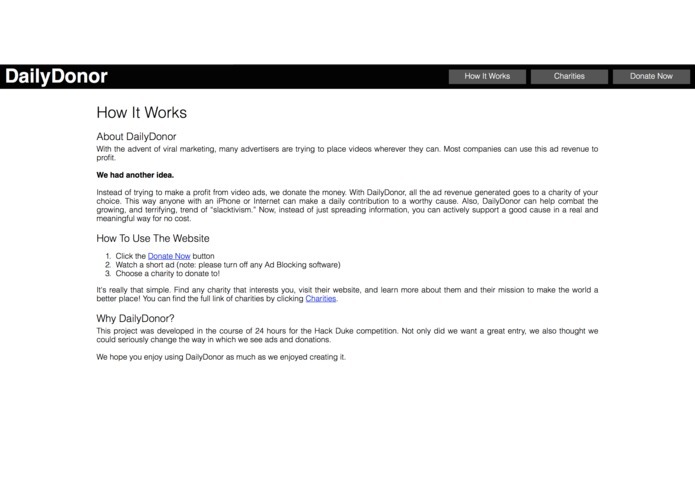 With DailyDonor, all the ad revenue generated goes to a charity of the user's choice. 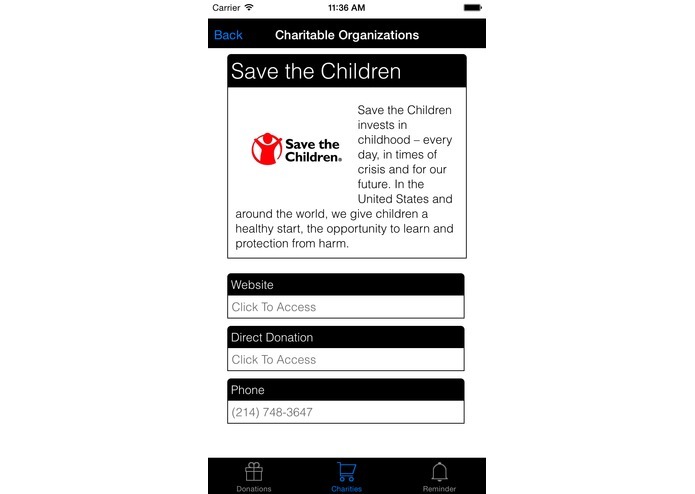 This way anyone with an iPhone or Internet can make a daily contribution to a worthy cause. 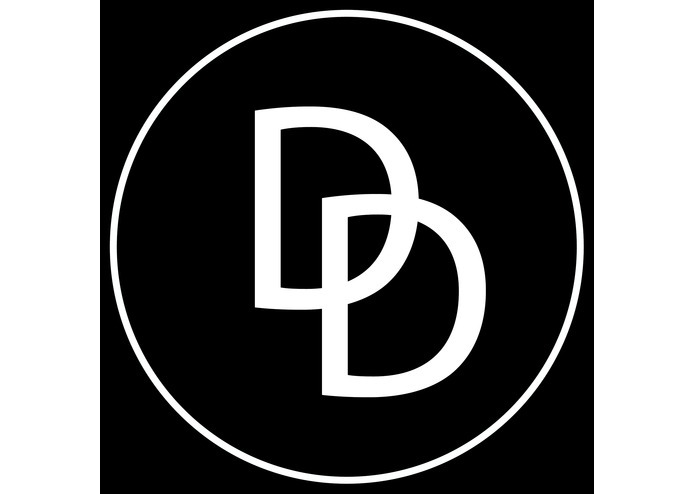 In addition, DailyDonor can help combat the growing, and terrifying, trend of "slacktivism." Now, instead of just spreading information, anyone can actively support a good foundation in a real and meaningful manner at no cost. 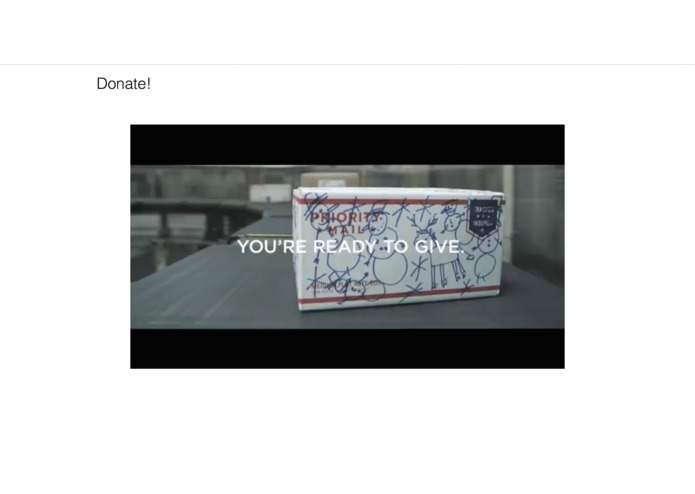 For us, this project was about streamlining the ad-viewing process to make it very easy for users to watch the videos and donate to a charity of their choice. One of the "coolest" features is that the website includes full AJAX and jQuery integration (i.e. you never have to leave the page). Additionally, we have many functional GUI elements: the animations and transitions help cement the flow of a user through our website. Plus, when actually viewing the ad, we push the nav bar up and lock scrolling to provide a clean and uninterrupted user environment for the ad. Of course, we also wanted to bring this to a mobile platform, so we have additionally developed an iPhone app. 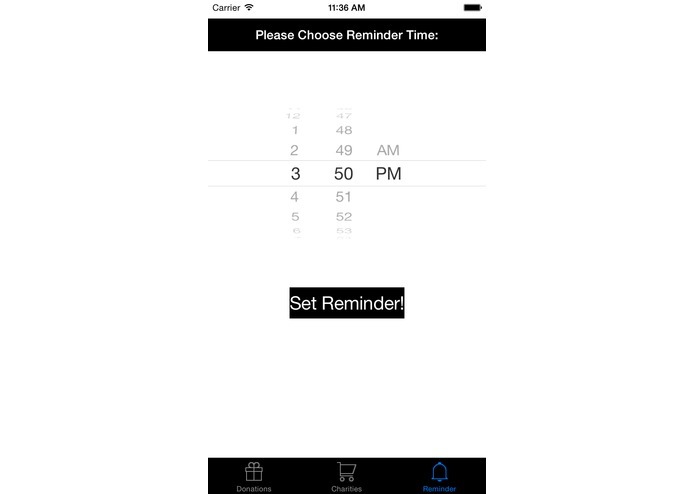 Within the app, a user can also set a daily reminder to watch an ad (this feature is yet to be fully implemented). 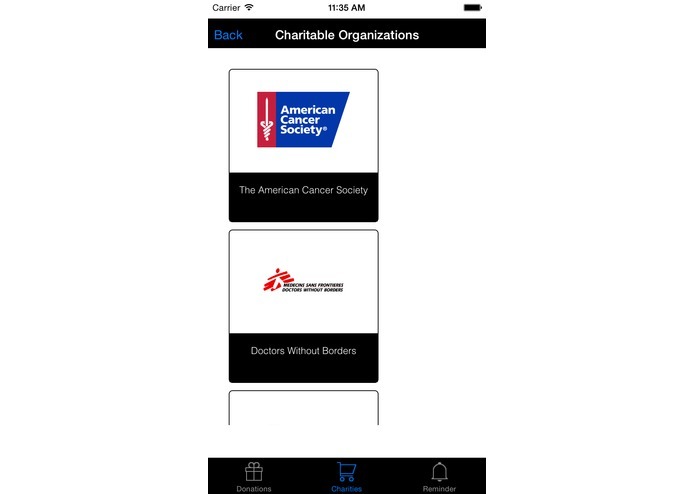 Finally, we have also integrated information about the charities directly into the website and the app. 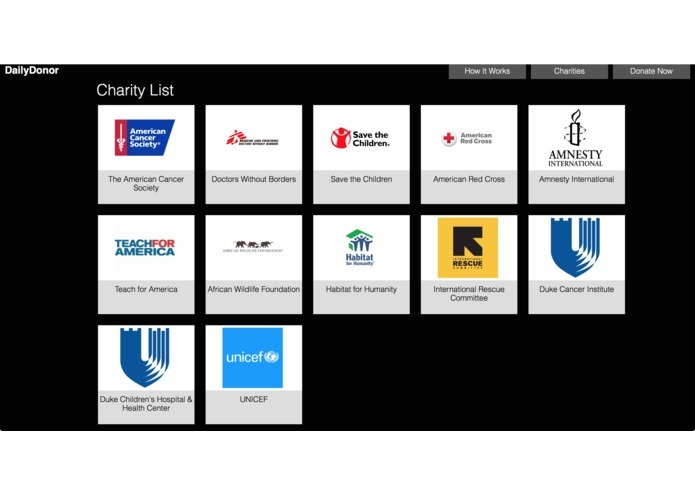 This way, users can quickly go to the charities' websites, a direct donation link, or call the charity from their computer or phone. The next step for our project would to be to get major ad networks and major charities on board to integrate better overall support. Then, we would try to work directly with companies, so there is no "middle man" delivering the ads. Finally, we would also like to provide incentives to donate through our rapport with businesses, like giving coupons and discounts to our users. We also want to create a "leaderboard" and GameCenter to integration to ignite a friendly competition of charity!